Top 30 Reasons Why Librarians Love Being a Librarian. SLOGAN CONTEST: Tell us why you love being a Librarian by completing the slogan "I love being a Librarian because..." Interesting original entries stand a chance to be featured here. 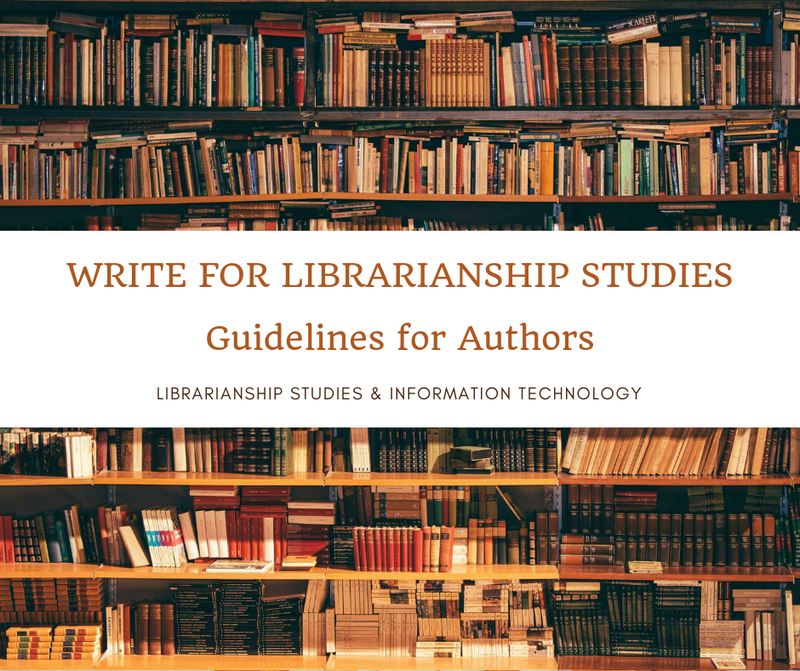 Winners will also be eligible to become a contributor to the Librarianship Studies & Information Technology blog. Please post your entries to the slogan contest "only" in the "comments section" of this article along with your name, designation, designation, university/college/institution, country, and optionally a brief profile. On 12th August, on the occasion of National Librarian's Day in India, the SAGE Publishing India Team organized a contest for completing the slogan "I love being a Librarian because..." where some entries stand a chance to win exciting prizes by them. It is to be noted that August 12th is celebrated as National Librarian's Day in India, in remembrance of national professor of library science, Dr. S. R. Ranganathan, whose birthday fall on August 12, 1892, who had spearheaded library development movement in India. I sent three slogans to them (SAGE Publishing India). One of this was judged as the winner of the slogan contest and won a prize from them (shown in pictures above). These three entries are very special to my heart and totally different from each other, where I have expressed my feelings of being a proud librarian and cataloger in different ways, first as a general person who loves the library space, second as a person who loves his country and wishes to contribute in the development of the nation building, and last but not the least as a cataloger which emphasizes the importance of cataloging. You may find these entries as given below numbered 1 to 3. Then I thought to extend this interesting idea by asking to complete this slogan "I love being a Librarian because..." to the readers of the Librarianship Studies & Information Technology blog, which has an international readership. This blog post is the result of this idea. So now it's a chance for you to let the world know why you love being a librarian. Interesting slogans received are listed below, in no qualitative order. We will add more interesting slogans as we receive them. I love being a librarian because for me nothing is pleasanter than exploring a library. 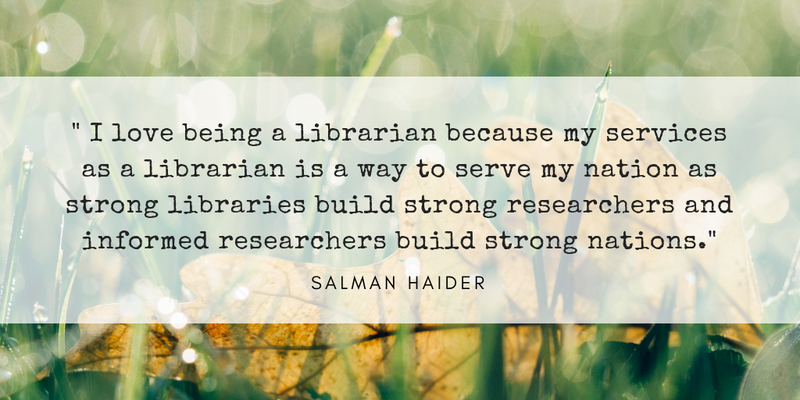 I love being a librarian because my services as a librarian is a way to serve my nation as strong libraries build strong researchers and informed researchers build strong nations. I love being a librarian because I want to help people find the information they need, whether it is in books, articles, or databases etc. by way of creating metadata about knowledge resources which makes them discoverable. I love being a librarian because I can help people find the information they want and also information they wanted but didn't know it existed. [I love being a cataloger because], I love making order out of chaos and helping people around the world find things they want AND things they didn't even know they wanted. I love it [being a librarian] because I change the future either by teaching kids to love reading or organizing the knowledge of today in a way that librarians of the future will find it. We are the products of 4000 years of librarianship that has been passed down personally to the next generation. If we don't save it, 200 years from now it will not be around. I love being a librarian because it is more than just organizing or shelving books. I can be a community educator, organizer, and innovator while enhancing my creativity in ways that will benefit the community as well as the library itself! Being a librarian has so much to offer in a sense that I am able to share my librarian skills, be it at problem solving, researching, retrieving, or information literacy, to the patrons. After all, that's what I'm here for; to serve and fulfill the community needs. I love being librarian because i'm being an instrument for the people to enhance their skills and knowledge through me by sharing what i learned through my studies and learn from other trends that librarians can disseminate or echo to the people who wants to learn even they're not going to school to studies. Librarian like me are like heroes for those uneducated people who want to learn from libraries where they can find librarians like me. I love being a librarian because I can spend every day on two things I really like to do... helping other people and be surrounded by books; it's like it's not even work at all. 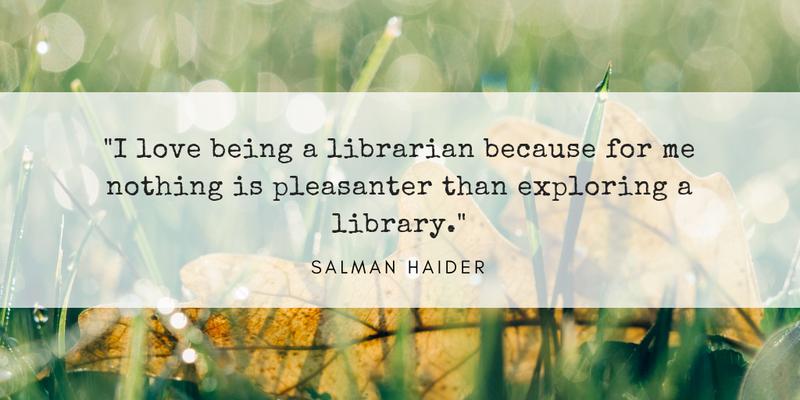 I love being a librarian because I can turn the library into a "playground" where the community can have fun, connect, interact and have lasting relationships with people and books. I love being a librarian because I love the reciprocity of my work. Everyday is a learning experience with our library clients and in turn they learn as well. 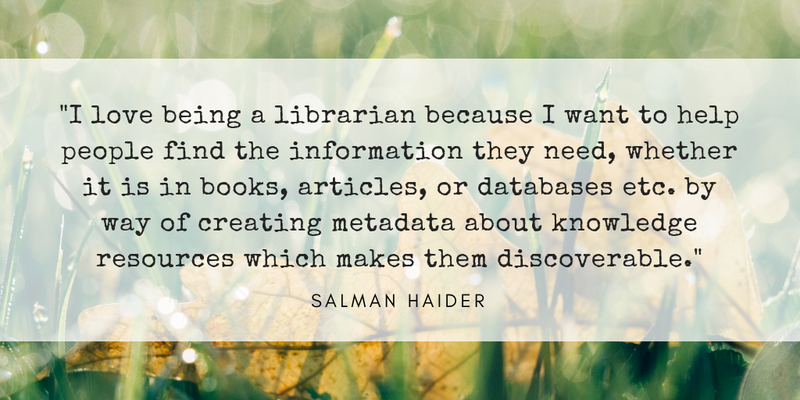 I love being a librarian because I connect the students, faculty, and researchers with relevant information, so that they can create new knowledge. I love being a librarian because I find pleasure in being a part of that unique sense of comfort the Library provides. Either in their need on knowledge, resources or the facilities, to connect with the community and exact the effort to fulfill all these always generate a feeling of content in self. 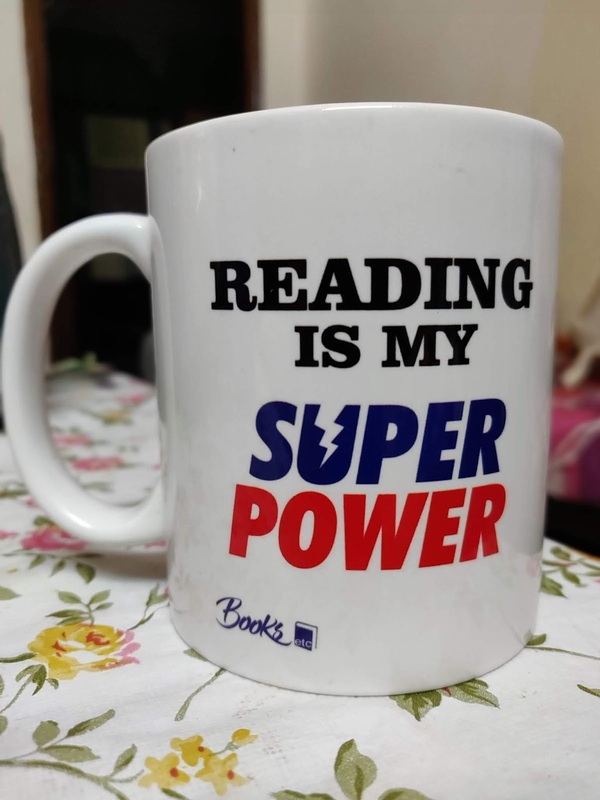 I love being a Librarian because I have the power to be the doctor of knowledge, to share the information to all the people, to push them study or read more books, articles, Journals, educational websites, Librarians can share the academic research to the whole world. Socrates said that didn't know anything.. Librarians doesn't know anything but they are able to help anyone to find whatever is looking for. I love being a Librarian becouse I believe knowledge is power. I love the librarian because there is something new to learn and teach every day. Every day, you are in touch with the information of each subject and each discipline, and from individuals and visitors you also learn about their research. A kind of permanent and compulsory education towards growth and excellence. I love being a librarian because I believe that knowledge need to be organized and shared in the right way. Because I love kids and telling them stories and reading books to them. Love to meet new people and help them finding new books and resources. I love being a Librarian because here i can serve people... I can help them to motivate, to work for their dreams, to learn something new... in simple terms i can be a part of their success which leads to them forever. They will remember me whenever that success will touch their feet. Every moment I give a hand, crossing a bridge of information to reach the light of knowledge cause at the end of a walk a smile illuminates all the faces in a beautiful world of help, that's why I love being a librarian. I love being a librarian because I able to provide knowledge to the community I work for, I give light to those who were not aware of certain issues and what is happening lately, I am able to raise a village and I transform minds and make the impossible look possible. I love being a librarian because I love to help others to reach their goals and because I love classification. I love being a librarian because I enjoy connecting people to the information they are looking for. I love being a librarian because it is a vocation--helping people to help themselves to reach their needs and goals. Librarians are a sort of cross between pastors of the mind and doctors of the soul. Because they empathically know the ratio of information to disseminate according to user requirement. I love librarians because they empower people to learn, lead and succeed in life in purely democratic way without any discrimination of power, wealth, caste, color, religion or any other... Yashveer P Singh, EBSCO. This multimedia article is widely discussed, appreciated, cited, referred, and hyperlinked. Some places where it is discussed and referred are given below. Princh Blog - a summary of interesting findings of this article is shared as a post on Princh Blog titled "I Love Being a Librarian Because: Top Reasons Why Librarians Love Their Job".